Heat oven to 350°F. Line cookie sheet with foil. Place wire rack on top of cookie sheet. Arrange bacon in single layer on top of rack. Bake 10 minutes. Sprinkle bacon with half the brown sugar. Bake 10 minutes longer. Turn bacon over; sprinkle with remaining brown sugar. Bake 10 to 15 minutes longer or until golden brown. Remove from rack. Cool completely, about 15 minutes. Crumble bacon into small pieces; set aside. Heat griddle or skillet over medium-high heat or electric griddle to 375°F; grease with vegetable oil or shortening. In medium bowl, beat Bisquick mix, beer and eggs with whisk until blended. 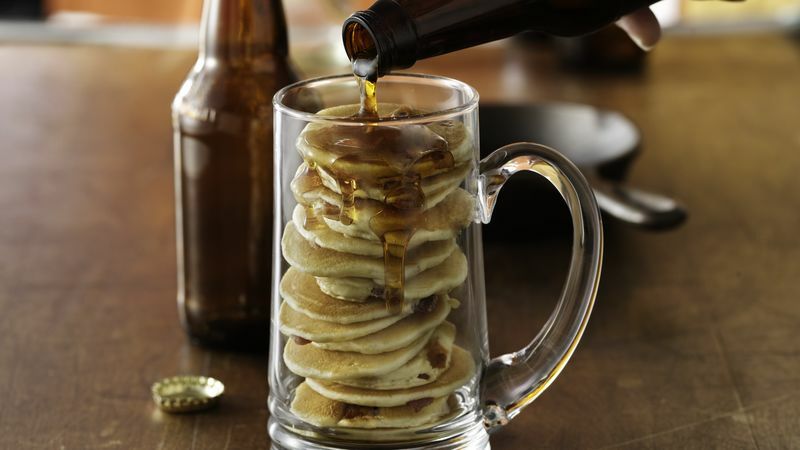 If batter is too thick, add additional beer until desired consistency. Stir in bacon. Pour by 1/2 cupfuls onto hot griddle. Cook until edges are dry. Turn; cook until golden brown.